Switzerland is known for its mountains, multi-tools, neutral foreign policy and delicious chocolate. What’s lesser known is that Switzerland is also a paddlers’ Utopia. This tiny country in the heart of Europe has only 0.4 percent of the continent’s land mass but holds six percent of its fresh water resources. What does that mean? More than 1500 lakes. Not too shabby for a landlocked country. Even better: you are never more than 10 miles away from a lake wherever you are in Switzerland. Granted, not all the lakes are large and spectacular but they all have different personalities ranging from mellow and Med-esque like the Lago Maggiore in the South to the harsher, wind-swept waters you will find at Urnersee. I set out to explore the lakes with my partner Stefan Munsch and was surprised that after living in Switzerland for seven years I still discovered new spots and hidden gems. One of my favorites is also one of the iconic Swiss lakes: Lake Geneva. Those who know me know that I love long-distance paddling, and in 2015 I decided to paddle the length of Lake Geneva along the French shore, 43 miles, in one day. The weather was perfect and the water calm. The changing scenery with medieval castles and picturesque villages along the shore made the 11-hour paddle truly enjoyable. Yet the definite highlight was the panoramic view of the snow-covered Alps. 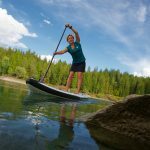 Lake Geneva is an ideal place to start one’s Swiss lake journey: It is not only the largest lake in the Alpine region but has many SUP rental stations and good places to launch along the shore. With its length of just over a mile, Lake Cauma is definitely not the place for a long-distance workout but if you are looking for warm, emerald water and fairy-tale surroundings, you’ve found the right spot. The lake near Flims in the county of Graubunden is fed by underground sources and its level varies depending on the rainfall in any given month. The lake is not accessible by car so paddlers have to hike for 10-15 minutes from the nearest parking lot. 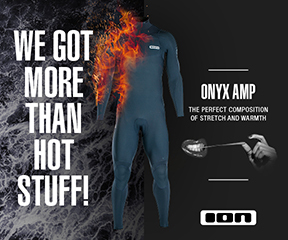 It’s best to bring an inflatable board and to avoid the summer months when the lake can get crowded. Because of its shallow depths, it warms up quickly in the spring so that you can combine a paddle with a comfortable swim early in the season. After paddling on Lake Cauma, our next stop was at Oberalpsee. At 6,647 feet above sea level, the air was markedly cooler and thinner. For those who travel Switzerland by public transport, there is a tiny train station next to the lake. You can take the Glacier Express, a steep cog railway, to get there and enjoy spectacular views along the way if the sky is clear. I wasn’t so lucky. A dense fog moved in a few minutes after I started paddling and blocked the view of the Alps, so we decided to move on. Switzerland is not only a country of mountains and lakes but also of glaciers. There are more than 1800 glaciers of all sizes located in the Swiss Alps with the largest ice masses occurring in the Bernese and the Valais Alps. Many Swiss valleys have been carved by glaciers in a process spanning millions of years. The majority of Swiss lakes were once glaciers and formed during the last ice age. The glaciers’ stark beauty, majestic size and intense colors have always fascinated me. But I wasn’t prepared for the feelings that gripped me when I was finally able to paddle a glacier lake. Because of safety and environmental concerns, I had to obtain a special permit and promised not to give any travel advice since the lake isn’t open to paddlers. Thus, I have to keep the location of the glacier lake somewhat vague. 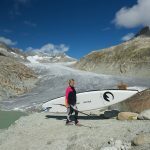 I took my 12’6 Aqua Inc AirRider board and carefully lowered it to the icy waters that have formed beneath the glacier during the last decades. 20 years ago, this area was still covered by thick sheets of ice and the mere existence of the lake is a reminder of how our world is changing. 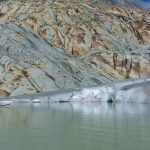 The vast majority of glaciers in central Switzerland will have vanished by the end of the 21st century, a study by Fribourg University has revealed. Swiss scientists estimate that 500 to 600 new lakes will form in the process with a total surface area almost as big as Lake Michigan. As I took the first paddle strokes in the icy turquoise waters, I was awestruck. Shivers went up and down my spine, not because of the cold but because of a mysterious energy and raw power I felt in the ancient water. I love paddling on all kinds of bodies of water – my favorite is the ocean with its unbridled power – but this was special. I felt connected to the planet in a way that I had rarely felt before and didn’t want the experience to end. I paddled closer to the glacier to take in more of its energy and savored moments on the water I will never forget. This is one reason why I love SUP: my board takes me to places that I would never get to experience if I didn’t paddle. As we drove down the tortuous mountain roads, we came across a lake that immediately struck me with its beauty. It started as a gorge with steep rocky walls before it opened up into a basin that serves as a water reservoir. I had never heard about the lake or its quaint name: Rätherichsbodensee. We walked down to the steep bank and found a good place to launch amid big rocks and boulders that gave the place an archaic feel. I heard the rushing sound of a waterfall around the corner and enjoyed the cool spray as I paddled closer to it. The rest of the paddle on the reservoir was serene and I relished the meditative calm water and the occasional ray of sunshine that broke through the cloudy sky. Calm and serene is not always what I am looking for. Since my first visit to Maui in 2014, I have been infatuated with downwind paddling. I love the wind and the waves but I hardly ever get to experience the exhilarating downwind-feeling in Switzerland. When the weather forecasters predicted a storm with winds of about 50 knots, some friends and I decided to go to the Urnersee, a part of Vierwaldstättersee that is known for its strong winds. The lake did not disappoint. The wind whipped up some good-sized waves but other than ocean swell, the waves were short, choppy and steep. Still, it was a fun adventure that I hope to repeat next time strong winds are forecast. 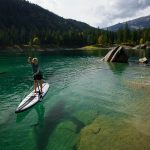 If you want to go for a downwind paddle on Urnersee, it’s best to go with someone who knows the area as there only a few launch spots and several nature reserves in which paddling is prohibited. Wear a leash and a PFD to be safe in the cold water and be prepared to paddle a lengthy section with strong headwinds or crosswinds as the wind direction can change swiftly. Also, it may be a good idea to let the police in both Uri and Swyz, know what you are planning. Otherwise, they may try to rescue you even if you are perfectly fine and are actually enjoying yourself tremendously. To people who aren’t as enthusiastic as you about wind and waves, enjoying strong winds may sound improbable and they might try to charge you a hefty fine for the unwanted rescue effort (yes, it could happen). The next lake I wanted to explore was Sihlsee, the largest reservoir in Switzerland that provides electricity to the Swiss railway. The lake is 5 miles in length and offers great views of the Fluebrig massif with peaks more than 6800 feet high. The lake is popular with windsurfers and the wind can be quite gusty. These are just a few of the many lakes in Switzerland; other all-time favorites include Lake Brienz with its turquoise waters and neighboring Lake Thun set in the spectacular mountain scenery of the Bernese Oberland. With so many choices, it is hard to pick the ultimate place to paddle. Sarner See is another great paddling spot and Lake Lungern is especially beautiful in the fall when the foliage turns red and golden.